Have you ever considered how sustainable your shoes are? Planet Shoes sells a variety of earth friendly shoes including Earth, Merrell, Pantagonia, and SOLE. 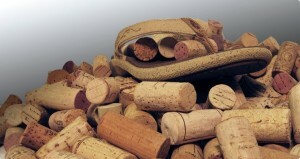 The SOLE line of shoes is a casual flip flop with the sole made of recycled cork from wine bottles. SOLE works with ReCORK to recycle natural cork through a partnership with restaurants, bars, and recycling drop off locations. Cork is 100% natural, biodegradable, and renewable making it a very earth friendly material. The durability of cork makes it perfect for flooring, soil conditioners, and yes – even shoes! I am excited to add a pair of white SOLE casual flip flops to my growing earth friendly shoe collection. They are perfect for the sunny Florida weather and beach trips. While they are quite comfortable, they do take a few weeks to form to your foot to get that perfect feel. In honor of Earth Day, Planet Shoes is running several promotions on their website and their Facebook page. They also offer a weekly giveaway, daily deals, and Planet Reward loyalty points. What are your favorite earth friendly shoe brands or styles? What do you do with your wine corks?